To keep members in homes post-Hurricane Harvey, TDECU agreed to 10,000 mortgage forbearances and worked to modify mortgage terms. To date, the credit union has not foreclosed on any home affected by the storm. Hurricane Harvey made landfall in southern Texas on August 25, 2017, as the first Category 3 or above storm to make landfall in the United States since 2005. By the time the Category 4 storm dissipated, and the damage tallied, Harvey tied Katrina as the costliest storm on record — inflicting $125 billion worth of damage. Harvey ranks as the wettest storm on record. It dropped more than 60 inches of rain in southeastern Texas, flooded hundreds of thousands of homes, displaced 30,000 people, and prompted 17,000 rescues. Although Harvey is almost unprecedented in scope, southeastern Texas has faced its fair share of hurricanes. It’s why area businesses and financial institutions like TDECU ($3.2B, Lake Jackson, TX) have hurricane-tailored disaster programs. In the wake of Harvey, TDECU’s relief efforts included one particularly significant goal: Keep 100% of members affected by Harvey in their homes. And so far, so good. In this Q&A, Rhonda Pavlicek, senior vice president and CFO at TDECU, discusses the 100% goal, what programs TDECU instituted in the days immediately following the storm, and the credit union’s total financial obligation. How many members of TDECU were affected by Harvey? Rhonda Pavlicek: Approximately 30%. We used data from the local counties to determine where flooding occurred and then layered where our members lived on top of that. We took that layering to identify the areas where there could have been damage. Based on our analysis, about 30% of our membership was affected in some way, shape, or form — whether a car, a house, or even a job. Talk about your goal of keeping 100% of members in their homes. 132 mph: Harvey's maximum wind speed. 60.58 inches: Harvey's peak rainfall amount. 57: The number of tornados reportedly produced by Hurricane Harvey. 35,700: The number of homes, in nine Texas counties, flooded or damanged by the storm. 336,000: The number of people who lost power during the hurricane. 500,000: The number of cars reported flooded during the hurricane. RP: The mortgage people have on their home is just paper and numbers. When you think about the precious components of what a home represents, it’s pictures and memories. We wanted to help our members keep those memories — in whatever shape they were in after a destruction on the scale of Harvey. We believed the human thing to do was to try and keep every member in their home. That was our intent. When a disaster like this occurs, what do you expect the initial financial impact to be? RP: It depends on the breadth and depth of the storm. We do a lot of hurricane planning because it’s common for our area. Part of that planning includes estimating the financial impact and identifying how the decisions we make will support our members. Between keeping our systems up and available, supporting members, and paying for employees to relocate, the costs add up. Three days before Harvey hit, we instituted our business continuity and hurricane disaster plan. We have an incident response team, so our responsive parties started to mobilize and ask what we needed to do; for example, did we need to move employees? We moved our disaster support team — which includes folks from IT, accounting, call center, cards, and more — to Dallas so they could remain operational. 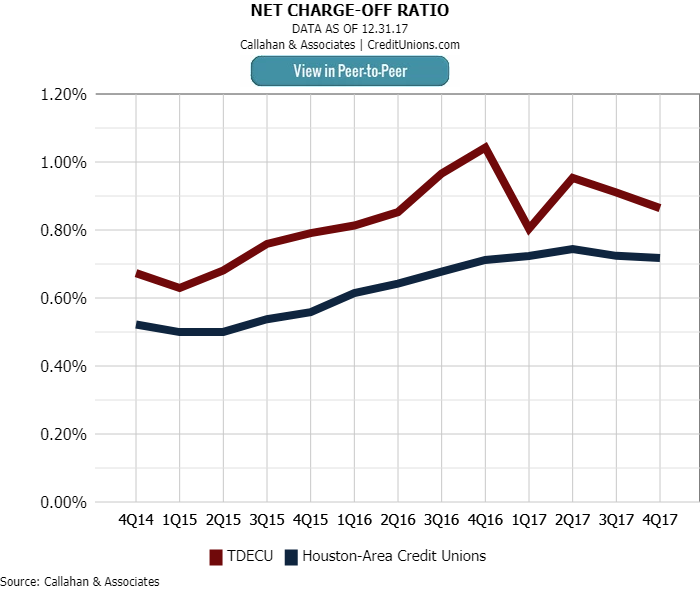 Although 14 basis points higher than Houston-area credit unions, TDECU’s net charge-off ratio has improved each of the three previous quarters. 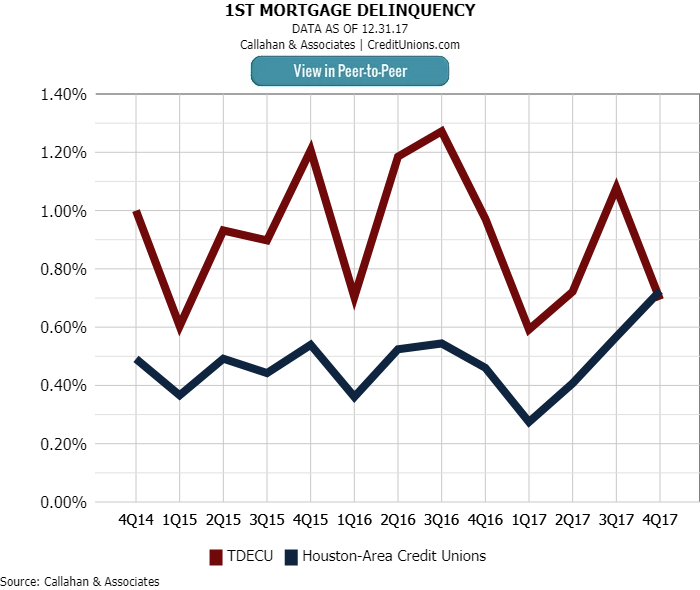 TDECU’s first mortgage loan delinquency of 0.69% bests the performance of area credit unions by 3 basis points, though performance at Houston credit unions worsened by a full 50 basis points across 2017. 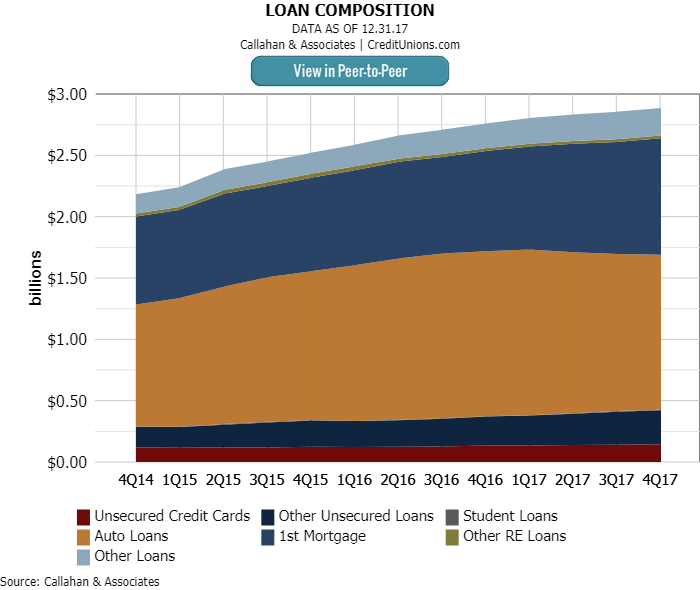 TDECU increased its unsecured loan portfolio by approximately $12 million between third and fourth quarter 2017. In comparison, these portfolios increased by less than $500,000 on average at Houston-area credit unions. What are some things TDECU did for members? RP: We didn’t charge late fees for the first 60 days after the storm. We instituted emergency loans of up to $5,000. We made 60,000 loan extensions in our auto loan portfolio and agreed to 1,000 mortgage forbearances. For us, it was about taking the pressure off members who were dealing with the storm. We also never lost our card system. ATMs were up, and our credit and debit cards worked 100% of the time. The call center was up so members always had full financial support. How long did you agree to suspend mortgage payments in those forbearances? RP: Forbearances are for 90 day installments and can be requested for a full year. Once they come out of the forbearance, we had to make sure they could repay. We created a loan modification team to modify and re-adjust members’ loans because we knew members were going to reach out with this request. We’re continuing to monitor those until the risk is fully mitigated, but all indications thus far show full repayments. The mortgage people have on their home is just paper and numbers. When you think about the precious components of what a home represents, it’s pictures and memories. We wanted to help our members keep those memories — in whatever shape they were in. All told, how much of a financial cushion has TDECU provided in response to Harvey? RP: It was more than $5 million, all told. Are you seeing any losses? RP: We had proactively reserved, but we’re pleased with where we’re at from a delinquency and charge-off standpoint. We were there for our members, and they have been able to repay us. Out of our 10,000 mortgage loans, we have one potential foreclosure. RP: Our response team was so large that nearly everyone helped in some way. We realized we needed to stagger their help better. We would get calls all through the night, but we could have done a better job staggering their hours and giving them time to rest. Having two data centers helped us. It gave us the ability to move our incident response team to Dallas. We had never done that before, only tested it. We have business continuity and disaster recovery plans, but when we institute them, and they work, it’s a great feeling.